At the 2017 PEN Literary Gala, PEN America will honor Ukrainian writer and filmmaker Oleg Sentsov with the PEN/Barbey Freedom to Write Award in recognition of his commitment to the freedom of expression—particularly one’s right to dissent—despite suffering imprisonment and abuse at the hands of the authorities. Oleg Sentsov is widely regarded for work that includes two short films, A Perfect Day for Bananafish and The Horn of a Bull, and a full-length film, Gamer, that debuted to acclaim at the International Film Festival Rotterdam in 2012. His writings include scripts, plays, and essays, and he has continued to produce prolifically from prison. Sentsov lived in Crimea’s capital of Simferopol and was active in protests against then-President of Ukraine Viktor F. Yanukovych, who led a pro-Kremlin government before he was removed from office in February 2014. As Russia became increasingly involved in Crimea in 2014, Sentsov became an outspoken critic of Putin’s creeping hand into Ukraine. He delivered food to Ukrainian soldiers blockaded in bases by Russian military. 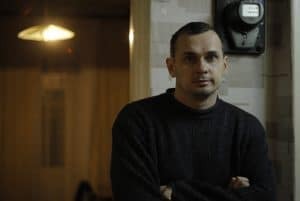 After the annexation of the peninsula in 2014, Russia’s Federal Security Service detained Sentsov in Crimea; he resurfaced a few days later in custody in Moscow. Sentsov was charged along with a co-defendant, Aleksandr Kolchenko, on suspicion of terrorism. During a trial hearing on August 25, 2015, Sentsov said he was tortured in an unsuccessful attempt to extract a confession. He had visible bruises on his body. Sentsov was sentenced to 20 years in a Russian prison on charges of terrorism on August 25, 2015. PEN America believes that the charges stem from Sentsov’s political activities, and has expressed concern about shortcomings in the judicial process that led to his sentencing. Appeals against the original verdict were rejected by the Russian Supreme Court in November 2015 and June 2016. A request for Sentsov’s extradition to Ukraine was denied in October 2016 on the grounds that he had become a Russian citizen upon the annexation. Many international governments—including that of the United States—believe that he has been convicted on groundless charges in retaliation for his anti-Kremlin views. On top of the fact that the Kremlin controls all the mainstream media, government restrictions have expanded to encroach upon other cultural spaces and modes of expression, including social activism, scholarship, art, and theater. More on that in recent PEN America’s report Discourse in Danger: Attacks on Free Expression in Putin’s Russia. In 2016, international human rights group Agora published a report on freedom of expression in the Russian-language Internet which states that the Russian-language Internet has become “a field for a large-scale cyber war” and that the country’s people are under “martial law”, according to Meduza.